Cartoon Network has been happy to leverage the appeal of its animated series into video games, with both Steven Universe and OK K.O.! Let’s Be Heroes receiving full-fledged console titles. Appearing on PC, PlayStation 4, and Xbox One earlier this year, OK K.O.! Let’s Play Heroes has now made its way to Nintendo Switch. It’s a game that will be primarily appreciated by fans of the cartoon series, but has enough appeal to make it an enjoyable experience for newcomers as well. OK K.O.! 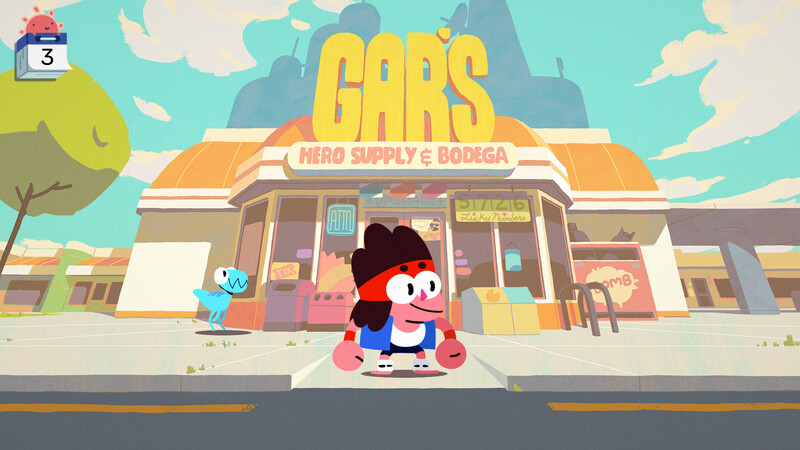 is set around Gar’s Hero Supply & Bodega; the store and its surrounding buildings offer supplies and services to all budding heroes. Unfortunately, right across from it is the competing Boxmore company, a counterpart for villains. Boxmore is run by Gar’s enemy Lord Boxman and, as is wont to happen in these sort of setups, it causes no end of conflict as Lord Boxman constantly sends his robotic children over to the bodega to cause mischief. One key element of OK K.O.! is Pow Cards, collectible cards that determine each hero and villain’s stats and abilities, and these drive the main plot along. Let’s Play Heroes sees the release of new Holo-Foil cards, but as part of his latest revenge plan against the Bodega, Lord Boxman buys out the Pow Card company and forces it to reduce all the heroes back to level zero. Main protagonist K.O. must work to help restore everyone’s levels, primarily by assisting the heroes in various ways and vanquishing Boxman’s other attempts at causing problems. A familiar sight for fans that will become even more familiar over the game. The writing is variable, some events and jokes provide good amusement while others fall flat and can lead to some tiresome sections, but these at least never last too long. 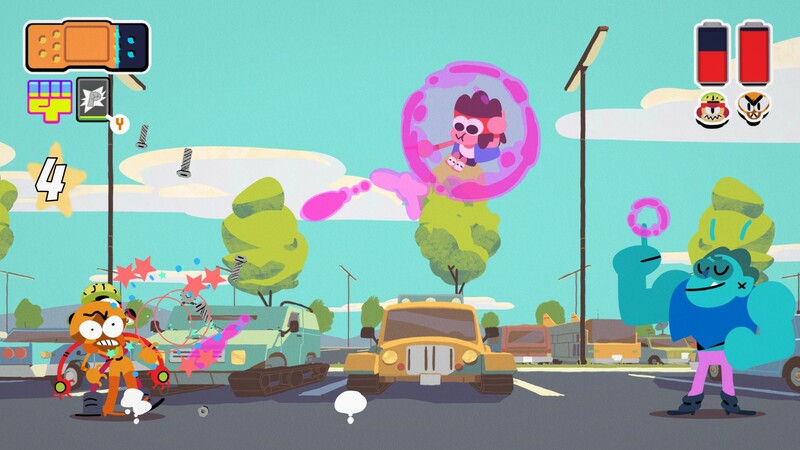 The story never tries to make things at all complicated, though the interactions K.O. has with his mother Carol are always heartwarming. There’s not much time devoted to adding depth to the game’s premise, instead everything takes an episodic structure while the heroes’ levels slowly go up, before the game decides that enough is enough and moves onto the finale. Combat is straightforward brawler fare, with K.O. primarily using a combination of leaps and dodges using the A button and regular combo and directional attacks with the B button. There are some charged attacks, though the general flow and balance of combat means these aren’t often aren’t worth the effort of using. What are worth the effort of using are the Powie-Zowie special attacks of the Pow cards K.O. has in his collection. These become available once K.O. has caused or suffered enough damage and activated by either the X or Y buttons. Initiating a Powie-Zowie causes the hero of the card to be summoned and launch a special attack, and are easily the best way for K.O. to get out of a tight spot. The game’s balance feels fair, but likely won’t provide too much challenge to experienced players, and any lost battle can simply be retried. A few major heroes have their Powie-Zowie’s unlocked naturally in the course of the game, while others require completing sidequests that invariably consist of finding certain items. Some items are obtained from shops or lying around, while others are dropped via randomly-placed encounters throughout the bodega, which can otherwise be completely ignored. The other light RPG element sees K.O. able to level up his three stats by earning experience in fights. Leveling up a stat can unlock an additional or slightly more powerful combat move, but there’s little reason to devote any extra time to increasing a stat. Players can buy boosters that increase stat growth, but given the limited amount of money available and limited benefit of leveling up a stat, it’s not worth the purchase. Robotic enemies offer a useful excuse for fighting similar opponents over and over again. Let’s Play Heroes has a consistent cycle: K.O. will arrive at the plaza with his mother and spend the first portion of the day helping one of the other characters, most frequently his mother or friend Dendy. He will then head to work at the bodega where he will assist one of his co-workers: Mr. Gar, Enid, or Rad. Players get a choice of which co-worker they assist on each day, but will end up going through the same set of tasks by the end. Unsurprisingly, these all end up involving beating up more Boxmore robots, though there are at least some unique boss fights to break up the otherwise familiar sets of opponents. It’s all pretty much what one would expect from a brawler and, running with the theme of the game, it’s effective without being spectacular. All of the cartoon’s voice actors reprise their roles for Let’s Play Heroes, so it is not surprising to hear that the voice acting is incredibly strong. The generic conversations and sidequest assignments are text-only, but the rest of the game is fully-voiced and accompanied by enjoyable, if ultimately forgettable, music. There’s a spattering of fully-animated scenes, but most feature the character models in more standard conversations. This works well, though it is noticeable that the fully-animated cutscenes are fully lip-synced but most events are quite clearly not. Let’s Play Heroes works well with the cartoon aesthetic of its parent series, but having to run back and forth through the same few locations and face the same limited enemies gets pretty dull after a while. OK K.O.! Let’s Play Heroes is a decent supplement to the cartoon series. It appears to achieve what it set out to do, but never sets its sights particularly high. There’s some good fun to be had and plenty of enjoyable moments, but it’s not a game that’s likely to stick in the memory for very long.